Join the discussion on our forums! Come discuss Crystal Power over in our dedicated Crystal Power discussion topic. 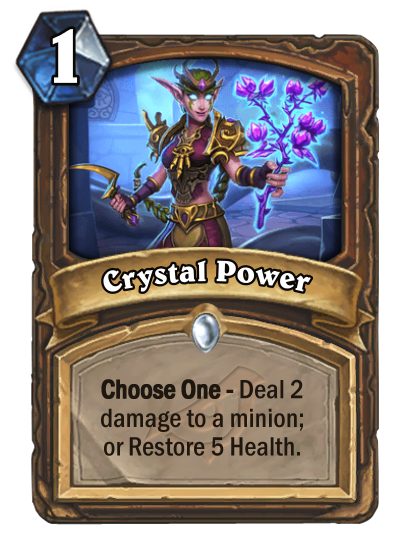 Choose One - Deal 2 dmage to a minion; or Restore 5 Health. Often used as healing crystals, but also good for throwing at people. The first Choose One card with opposite choices. Fandral Staghelm does not approve. Ornery Tortoise and Crystal Stag approve. Malygos approves. Yeah, I think there'll be plenty of fun with this one.